At a recent visit to the Cloughjordan Eco village we saw how a sustainable community requries a new generation of water cylinders which connect to a district heating system. These 800 litre tanks contain a smaller 250 litre tank for domestic hot water and the outer tank is used for underfloor heating or radiators. 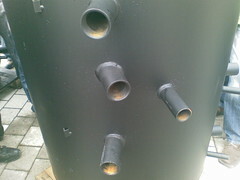 The image above only shows 30% of the connections to the tank. This evolution in heating design is matched by the evolution in heating controls which students of the Smart Sustainable Energy degree will study. I am experimenting with a Maxim iButton with a view to incorporating the device into our new computing degree in Smart Sustainable Energy Curriculum in Tipperary Institute. 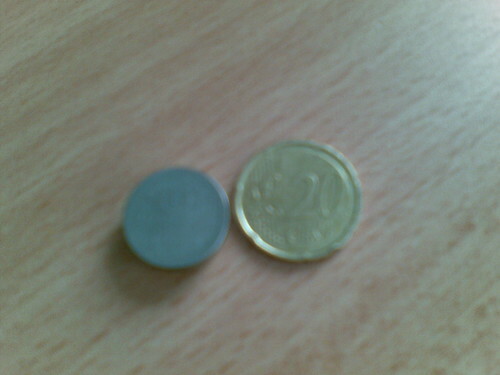 The unit is the size of a watch battery and slightly bigger as you can see above it is smaller than a 20 cent coin. Application development is supported through Java APIs and a number of other options. A reader/writer device to get information into and out of the button. This can be the Blue Dot, a pen-style probe, or a handheld device. A layer of software to interface iButtons to computers and produce the desired information in the desired format. Several software development kits (SDKs) are downloadable from this site at no charge. For a list of SDKs and links to download, see this page. We also offer 1-Wire Drivers for Microsoft platforms, along with the OneWireViewer, a demo application that can read/write/exercise any iButton. There is nothing new in Ireland about controlling smart appliances using GSM and Internet Technology. This technology allows the home owner to switch on or off appliances such as heating, washing machines etc. A new technology being tested in Canada utilises FM radio the Canadian national broadcaster has partenered with the Toronto based company e-Radio Inc The data is delivered over an FM sub channel. The attractive feature of this technology is the fact that FM radio is widely available and cover geographic areas where internet access may not be available. Low tech had a way of becoming the best tech.